Since I last posted the summer has arrived in its full glory and the additional rays on the balcony have spurred on all the plant life. 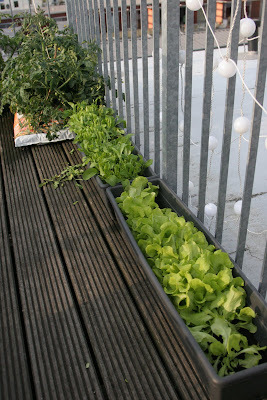 A 60 pence packet of mixed salad leaves has germinated and exploded out of the box and the lettuce is in full flight. The tomatoes have continued to grow and we now have about 50-100 small green ones happily ripening away. While I was in France there was a minor disaster with a clothes maiden but Phil's expert surgery (with medical tape!) soon put things right. Tomatoes are hardy fellas. It really is amazing what can be achieved with such a small space. A balcony which seemed only a minor addition to the flat during the winter months now sports a bbq, an acer, a clematis, a herb pot, 18 tomato plants, a salad box, and about 10 lettuces. Oh, and you can still sit 4 people comfortably, and 6 if needs be. City living isn't so bad. Tonight I sat on the balcony listening to Ryan Adams, drinking red wine, eating fresh home grown salad with lashings of dressing, and savouring the local delicacies of trout pate and charcuterie. Ok, not exactly local, but sourced from our local wine shop. Speaking of city vs country living I came across a blog recently which is the essence of country living romance. I've read through every blog post already and completely captivated by their life in Devon. http://locksparkfarm.wordpress.com/ - if you want to be carried away to a world of farming when the city is becoming oppressive take some time out to dig through their archives. The desire to start a smallholding one day is beginning to become a very real dream. Hopefully the next time you're invited to dip into Hamburg balcony life there will be a blush of tomato red to grace the blog.